United by our shared commitment of transforming cardiovascular care, we invite you to join us for an innovative educational experience that will strengthen your everyday practice. The 2018 ACC Middle East Conference provides an engaging forum to critically examine evidence-based strategies as well as contemporary best practices and clinical decision-making in order to reach our common objective of improving heart health of patients with cardiovascular disease. Strive to be your best  join us in our vision of a world where innovation and knowledge optimize cardiovascular care and outcomes. PLUS: Become an ACC International Associate member or if you're already an ACC member, get access to one of ACC's premier educational products. Advances in the prevention and treatment of cardiovascular disease (CVD) have yielded remarkably positive results, with a steady decline in CVD mortality across the globe. However, despite this remarkable progress, CVD remains the leading cause of death throughout the world and its prevalence remains high, making it a global public health priority and an intensive focus of research. Such research has led to new evidence that continues to accrue about the underlying pathophysiology as well as strategies to enhance CVD prevention, evaluation and treatment. As care of the patient with CVD becomes more complex, it is imperative that cardiovascular professionals have an opportunity for a comprehensive review of evidence-based practices and exposure to state-of-the-art updates, innovative techniques and translational research on the diagnosis and management of cardiovascular disease. By increasing their expert knowledge, participants should be able to identify guideline-driven, contemporary approaches to cardiovascular patient care. The abstract submission portal for the 2018 Middle East Conference is now closed. No additional abstracts will be accepted. We will notify authors of the accepted abstracts by September 20, 2018. Please note: All ACC Middle East Conference 2018 abstracts are embargoed until Friday, Oct. 26, 2018, at 8:15 a.m. AST/1:15 a.m. ET. ACC media staff will notify lead investigators if their submission is selected for further promotion. The ACC welcomes the participation of institutions in promoting research presented at ACC Middle East Conference 2017. All promotions must abide by the embargo date and time. For questions, please contact ACC Sr. Media Relations Associate Katie Glenn, kglenn@acc.org. Click Here to view the 2018 ACC Middle East Conference Agenda. The Personalized Skills Center offers a selection of modules to choose from to augment the learning that takes place in the traditional classroom. Sharpen your core cardiology skills while learning at your leisure on iPads by engaging in Heart Songs or ECG Drill and Practice modules. This is a uniquely dynamic learning opportunity you won't want to miss! Research reveals that cardiologists failed to identify more than half of basic murmurs and about 35 percent of advanced murmurs when challenged at a major medical meeting, but skills improved after a 90-minute training session. First, pick a track and assess your baseline skills by taking a confidential pretest. Then simply view videos featuring classic heart murmurs accompanied by phonocardiograms and color Doppler echoes. Each video includes hundreds of repetitions of its murmur, and studies show that simple repetition is all you need to master a new sound. Watch the videos as many times as necessary to see a significant improvement on your posttest scores (most people need to watch 2 to 4 times). Each Heart Songs track takes approximately 30 minutes to complete and sessions are self-paced. Heart Songs makes sure you know what your stethoscope is telling you! Brush up on a core cardiology skill with ECG Drill & Practice's 100+ ECGs and expert insight! Take an experiential, game-based deep-dive into acute and chronic cases covering a broad range of clinical scenarios with the help of the Body Interact Simulation. This physician guided, learn-by-doing approach is highly customizable and suitable for early career and advanced clinicians alike. Cases presented will utilize guidelines and clinical evidence, and will provide you with immediate feedback via a visual dashboard and expert debriefing. You won't want to miss this opportunity to test your skills and develop your clinical decision-making through real-time patient interaction and peer-to-peer discussion! This conference is CME accredited. Click here to register for the meeting, or visit saudi-heart.com/acc and click the "Register Now" tab. The registration rates include educational sessions, conference materials, continental breakfast, refreshment breaks and lunch. The American College of Cardiology's Leadership Development Program offers a half-day intensive live course that addresses various skills and knowledge in cardiovascular leadership. The program design provides you with a broad understanding of leadership styles and skills. This program addresses diverse perspectives on critical leadership challenges while also providing an awareness of concepts and techniques relevant to leading effectively within one's own healthcare institution. The ACC often draws upon those who complete this program for future leadership roles within the College. While strengthening leadership skills is a primary objective of the training course, the program also leverages having international leaders in the same room as an opportunity to exchange ideas and best practices. Lead by past president of the ACC, Dr. William Zoghbi, this interactive discussion allows attendees to provide special insight into their country's healthcare and leadership challenges. The program serves as a platform for emerging leaders in the cardiovascular community to gain a deeper understanding of the varied challenges facing the College's ever-growing international community. By connecting these emerging leaders, the program facilitates the building of professional relationships and creates new opportunities for collaboration that defy geographical distance. This program will be held as a pre-conference opportunity on October 25, 2018 in the Tiahama Room located on the 2nd floor from 13:00-17:00. Please contact Michael Phillips at mphillips@acc.org to register for this dynamic program. Don't miss the American College of Cardiology's In-Training Exam at the conference. The exam features over 140 case-based questions and is a great opportunity for Fellows and practicing physicians to help understand the areas they need to focus on and where they are now, and provides a review of their progress over time. This exam will be held as a pre-conference opportunity on October 25, 2018 in the Abha Room located on the 2nd floor from 13:00-17:00. Fee of $100 USD will be applicable. The mission of the American College of Cardiology (ACC) is to transform cardiovascular care and to improve heart health for patients throughout the world. The ACC strives to achieve its enduring purpose through its initiatives in education, research, quality care improvement and health policy. The ACC is an experienced education provider with a proven track record of designing and implementing activities and programs that facilitate knowledge transfer, sustain a wide reach, and produce a measurable impact on the behavior of health care professionals and patients. In addition, the ACC's global network makes it an unparalleled purveyor of global thought leadership in cardiovascular health and guidelines of care. Healthcare is a topic that has no borders, and the ACC is committed to improving cardiovascular health around the world through collaboration, knowledge exchange and resource sharing. ACC's commitment to improving global cardiovascular health is driven through targeted, localized initiatives, in partnership with leading cardiovascular societies around the world. This has been achieved through the development of International Chapters. Starting in 2009, ACC has been affiliating with leading cardiovascular societies around the world through these Chapters. The Chapters receive benefits from ACC such as joint sessions at major congresses, FIT membership, discounts on ACC activities, and opportunities to participate in ACC's Annual Scientific Session and other regional meetings. In exchange, these societies help to promote ACC to their local membership. Today, the ACC has 40 international Chapters and over 17,000 members outside the United States. The ACC has a proud history of engagement with cardiologists both inside and outside of the USA that dates back to its founding. In recent years, the ACC has continued to see 40% of attendance at the Annual Scientific Session coming from outside of the United States. While recognizing the success of the Annual Scientific Session, many trends, including changing regulatory frameworks and increased global education, mean that ACC's future strategy will need to rely on reaching clinicians where they live and practice through a variety of innovative and cost-sensitive platforms. The ACC is developing a proactive and forward-thinking strategy to meet the needs of this shifting global landscape using the conveniences of modern technology and customized educational interventions for our global audiences. The American College of Cardiology and the Saudi Heart Association are pleased to invite you to support a groundbreaking and innovative educational initiative — the ACC Middle East Conference, scheduled for October 25 – 27, 2018 at Le Méridien Jeddah. This conference is the third regional ACC conference in partnership with the ACC's International Chapters and presents a unique opportunity to reach a targeted group of 1000 cardiovascular professionals from amongst the Middle East in a truly intimate setting. The two and one-half day conference will feature exceptional educational content designed by internationally renowned faculty, and will cover the most cutting-edge research and technological advancements in cardiology. The conference will emphasize interactive education modules and hands-on clinical decision-making skills to best meet the real-world needs of cardiologists across the region. This innovative approach breaks new ground in the way that clinicians interactively participate in a conference and makes the ACC Middle East Conference the most exclusive and sought after professional development opportunity in the Middle East. Multiple opportunities exist to support the ACC Middle East Conference 2018 through customized sponsorships and an exhibitor presence. For sponsors, visibility and access to conference attendees will gain recognition of your company as a forward-thinking organization on the forefront of innovation and interested in perfecting the cardiovascular practice. For exhibitors, attendee flow into the exhibit hall will be maximized due to dedicated exhibit times, coffee breaks in the exhibit hall and co-location with a late-breaking poster session. ACC considers supporters like you to be a vital part of this conference, providing our attendees the opportunity to gather useful information about your products and services. Your participation as a leading innovator in the cardiology field will complement the unique format of the conference and allow you to make impactful connections with the current and future leaders of cardiology in the region. On behalf of the entire conference committee, we are excited to partner with you through the ACC Middle East Conference and look forward to seeing you in Jeddah! Location: The ACC Middle East Conference 2018 is being held at the Le Méridien Jeddah, Saudi Arabia. 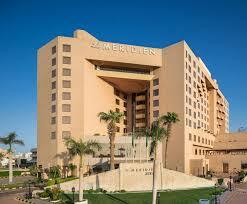 The Le Méridien Jeddah, pairs palatial surroundings with luxury hotel amenities. Dining captures both Saudi Arabian and international flavors. Saudi Arabia's second-largest city, Jeddah sits along the Red Sea, acting as a gateway to Makkah and a hub for commercial business. Sculptures and artwork are scattered throughout the city, a reflection of its intention to be an open-air museum, and the appreciation of art can also be found in galleries and museums in the city center and beyond. Set along the corniche, the hotel is ideally located for both business and leisure visitors with Tahlia and Palestine Streets, Al Balad and Jeddah Fountain and luxury shopping all nearby. King Abdulaziz International Airport is a quick 30-minute drive.